Six-year-old girl, Sheba Mackenzie and five-year-old Victor Mesmin were the first patients to have open heart surgery at the Port Moresby General Hospital on Sunday. Both from Milne Bay are now recovering in ward 7 after they were moved from Intensive Care Unit yesterday. Port Moresby General Hospital's leading heart specialist (Cardiothoracic) Surgeon Dr Noah Tapaua led the local doctors and nurses including Open Heart International Australia heart specialist team and repaired the holes in the heart of children. Dr Tapaua said 13 more children are lined up for the open heart surgery for this week till Thursday with youngest at the age 1 month and oldest nine years. In the precious years the Operation Open Heart Programme focused mainly on service delivery where 60-70 international heart specialists with less number of locals performing heart operation to 45-50 children annually. 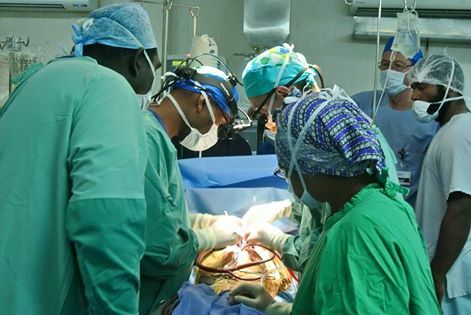 However, the OOH programme has greatly improved with great support of genuine partners through Operation Open Heart foundation focusing on training more local doctors and nurses. Dr Tapaua said so far 29 nurses, two per fusionists, one anaesthetist and one cardiothoracic were trained. “The biggest challenge now is to have a heart centre provided with equipment so local doctors and nurses can fully use the skills and save more than a thousand lives they are saving now,” he said. Dr Tapaua also added that the local team had cut down the number of heart patients for operation so the doctors and nurses can focused on training when dealing with two to three cases per day. “We want to perform quality surgery and doing it properly with less number of patients so when we are confident enough, we will do more open heart surgeries,” Dr Tapaua said.